South Canterbury, in the central South Island of New Zealand, is rapidly becoming a sporting base of choice for major tournaments and events. Easy access, affordable South Canterbury accommodation and plenty of activities for families and supporters ensures any visit becomes a memorable occasion! Sporting activities and events play an important part in the daily lives of South Canterbury residents. Sporting facilities, both indoor and outdoor, are plentiful. 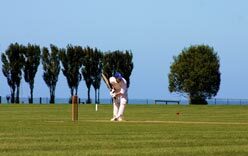 Parks, gyms, international tennis facilities, netball, soccer, rugby, athletics and cricket grounds, swimming pools and events facilities are widely spread throughout the South Canterbury region. No matter where you live in South Canterbury, you will probably be less than an hour from the ocean and less than two hours from a ski field! On the same day you can mountain bike, snowboard and surf....take your pick! Outdoor pursuits – white water rafting, kayaking, fishing, hunting, horse riding, walking and hiking, mountain biking, sailing, golf, 4 wheel-drive tours and much more, are plentiful and easily accessible within a short drive from Timaru or any of the smaller town centres within South Canterbury. Browse our Attractions and Activities section for more information on outdoor activities around South Canterbury. South Canterbury has a very active and continually growing events programme and regularly hosts national events. The Caroline Bay Carnival, the longest running carnival of its type in New Zealand, has been a favourite with families from all over the country since its early days 100 years ago. See our Events section for more information on other major South Canterbury events, including the Timaru Festival of Roses, Geraldine Arts & Plants Festival, Waimate Strawberry Fare and motor sport racing at the Timaru International Motor Raceway.